Student organizations from the C. T. Bauer College of Business were recognized for achievements made in the 2016-2017 academic year. The C. T. Bauer College of Business recognized outstanding student leaders and organizations during the 17th Annual Leadership & Awards. 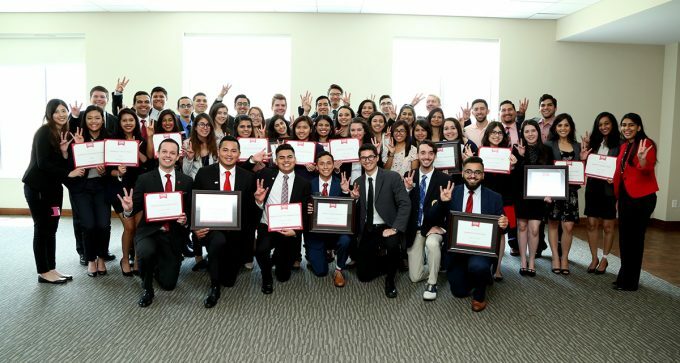 Student organizations were recognized in categories of Bauer Pride, Community Engagement, External Relations, Innovation and Leadership, demonstrating extraordinary accomplishment in each area. Bauer College Dean Latha Ramchand welcomed and congratulated the students on their success. During the ceremony, students heard from Walter Johnson, founder of Amegy Bank, where he shared stories of success, and failure.